Saint Joseph, how fitting it was that at the hour of your death Jesus should stand at your bedside with Mary, the sweetness and hope of all mankind. You gave your entire life to the service of Jesus and Mary; at death you enjoyed the consolation of dying in Their loving arms. You accepted death in the spirit of loving submission to the Will of God, and this acceptance crowned your hidden life of virtue. Yours was a merciful judgment, for your foster-Son, for whom you had cared so lovingly, was your Judge, and Mary was your advocate. The verdict of the Judge was a word of encouragement to wait for His coming to Limbo, where He would shower you with the choicest fruits of the Redemption, and an embrace of grateful affection before you breathed forth your soul into eternity. You looked into eternity and to your everlasting reward with confidence. If our Savior blessed the shepherds, the Magi, Simeon, John the Baptist, and others, because they greeted His presence with devoted hearts for a brief passing hour, how much more did He bless you who have sanctified yourself for so many years in His company and that of His Mother? If Jesus regards every corporal and spiritual work of mercy, performed in behalf of our fellow men out of love for Him, as done to Himself, and promises heaven as a reward, what must have been the extent of His gratitude to you who in the truest sense of the word have received Him, given Him shelter, clothed, nourished, and consoled Him at the sacrifice of your strength and rest, and even your life, with a love which surpassed the love of all fathers. God really and personally made Himself your debtor. Our Divine Savior paid that debt of gratitude by granting you many graces in your lifetime, especially the grace of growing in love, which is the best and most perfect of all gifts. Thus at the end of your life your heart became filled with love, the fervor and longing of which your frail body could not resist. Your soul followed the triumphant impulse of your love and winged its flight from earth to bear the prophets and patriarchs in Limbo the glad tidings of the advent of the Redeemer. 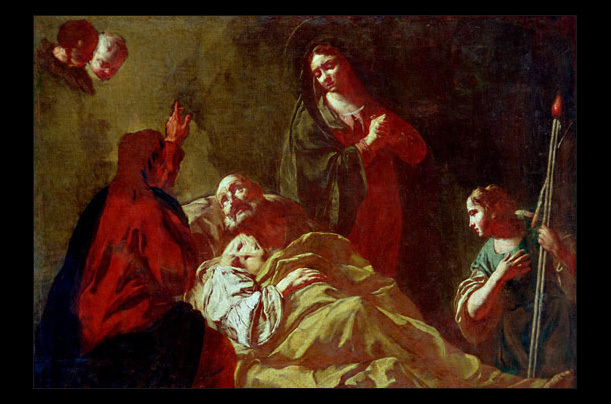 Saint Joseph, I thank God for your privilege of being able to die in the arms of Jesus and Mary. As a token of your own gratitude to God, obtain for me the grace of a happy death. Help me to spend each day in preparation for death. May I, too, accept death in the spirit of resignation to God’s Holy Will, and die, as you did, in the arms of Jesus, strengthened by Holy Viaticum, and in the arms of Mary, with her rosary in my hand and her name on my lips! MEMORARERemember, most pure spouse of Mary, ever Virgin, my loving protector, Saint Joseph, that no one ever had recourse to your protection or asked for your aid without obtaining relief. Confiding, therefore, in your goodness, I come before you and humbly implore you. Despise not my petitions, foster-father of the Redeemer, but graciously receive them. Amen. This entry was posted in lent, novena, prayer by coffeemom. Bookmark the permalink. >Thank you, again:), to your Son, and, also, to you, for sharing the words of this beautiful Novena. It has been a JOY to unite in prayer with many. Thankful, to Saint Joseph!Saint Joseph, pray for us. >One of the few times I have actually finished a novena without missing a day – I cannot thank you enough – St Joseph, graciously hear us! >Kristin, Brava to you for keeping up with it! I know just what you mean, I often mess up and miss a day, and this helps ME to post them daily as much as anyone I think. And I love the company so thanks for praying along with me! I love St. Joseph, and our family can certainly use his prayers, as can oh, most every other one as well. Bless you. Tomorrow's the feast day!